While P.I.E. Environmental and the Sea Turtle Patrol are discreet organizations, they share many of the same environmentally concerned volunteers. P.I.E. also provides funding for some of their needs, such as their uniform hats and shirts and special equipment requests. All species of sea turtles in Florida are listed as either threatened or endangered by the federal Endangered Species Act. In addition, sea turtles are protected by Florida Statute 370.12, the Marine Turtle Protection Act. Anyone found harassing a sea turtle or interfering with the nesting process faces criminal and civil penalties. The mission of the "Don Pedro Turtle Patrol" is to nurture and promote an environment which contributes to the healthy propagation of the sea turtle, a valued natural treasure. With the assistance of public and private support, the aim of this organization is to provide turtle patrol volunteers with the necessary equipment and materials to monitor sea turtle embryos and hatchlings so they may safely enter the waters of the Gulf of Mexico in their journey to adulthood. The Turtle Patrol Team is made up of 10-15 volunteers. They are permitted by the Florida Fish and Wildlife Conservation Commission. The Island (Don Pedro, Knight, & Palm) is divided into 10 zones and each morning from May 1 until Oct. 31 the volunteers document all new nests and every new false crawl. They watch over the nests and care for them as needed. As the season grows to a close, they document the number of babies hatched and unhatched, the number of babies destroyed, and the number of dead and alive babies in the nests and count the total of all the eggs in the nests. The patrol mainly documents the activity of the loggerhead sea turtle but has had occasions to document a few green sea turtle nests also. The loggerhead sea turtle (Caretta) is easily distinguished by its relatively large head. The green sea turtle (Chelonia mydas) gets its name from the greenish color of its body fat and has the presence of a pair of scales on the front of its forehead. l. Please stay behind her at a distance so that she cannot see you. Keep your distance, remain quiet, and keep lights off. 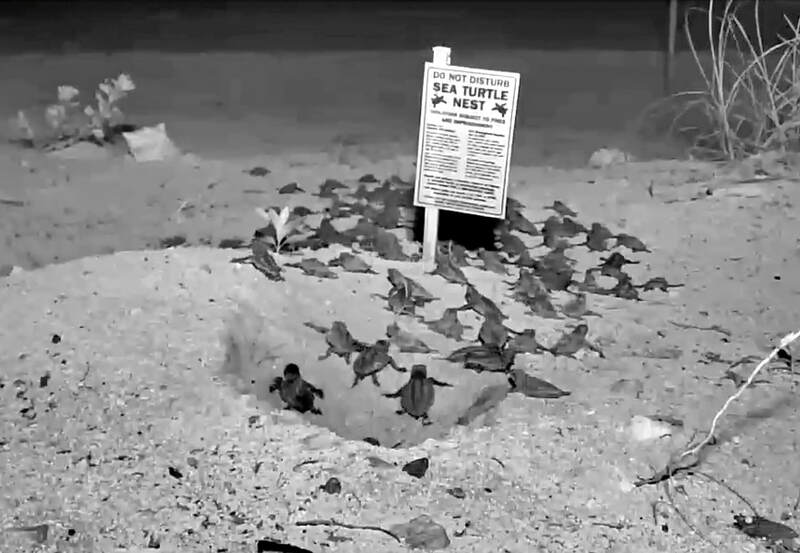 Noise and any light can cause the turtle to abandon her nest and return to the gulf. 2. Please keep hands and other objects off and away from the turtle. (After nesting, she may appear slow and hesitant.) Touching, prodding, shining light, or causing commotion may frighten her, disorient her, and cause her to spend less time covering and camouflaging her nest. 1. Please watch them from a distance. 2. Please allow hatchlings to crawl to the water on their own, as the journey from the nest to the water allows them to imprint on their home beach. That imprint, Scientists believe, helps hatchlings remember where they came from, so they can return and lay their own nests 20 to 30 years later. 3. Please leave hatchling sea turtles in their nest; they will exit when they are ready and will have a much better chance of surviving. 4. Please keep all lights off. If hatchling turtles see artificial lights they become confused, crawling in circles and heading away from the ocean causing them to be eaten by other animals or to die of dehydration. Leave nests and signs undisturbed! Shield or turn off all lights that shine on the beach! Remove beach furniture, toys, and equipment from the beach every night. Keep pets off the beach! Remember that motorized vehicles and campfires are prohibited! FWC, Division of Law Enforcement: 1-888-404-FWCC or *FWC from your cell phone. Remove chairs, canopies, boats and other items from the beach at night, because they block the movement of turtles and hatchings. Turn off or shield lights along the beach, in order to prevent hatchlings from getting confused and going toward lights on land instead of the salt water, where they belong. Use red LED flashlights on the beach at night, adjust cell phone screens to dark mode and don’t take flash photos. Fill in holes that people dug in the sand during the day, so nesting sea turtles and hatchlings don’t fall in and get stuck there at night. Correctly dispose of fishing line, so it won’t entangle sea turtles and other animals. Remember it is illegal to harm, harass or take sea turtles, their eggs and hatchlings, including getting too close to a nesting female.